Pumpkin pancakes topped with Kelapo coconut oil and warm syrup! Yum! It’s officially Fall! Bring on the pumpkin recipes! 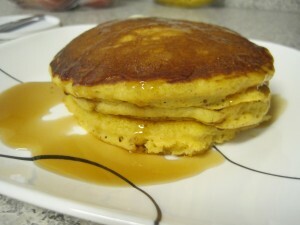 Pancakes are an easy weekend breakfast to make and incorporate some pumpkin to get into the fall spirit. 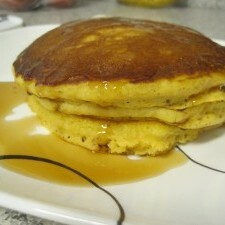 Here is a great recipe for pumpkin pancakes. You can add whatever you want into the batter. I like to add sliced bananas and a few chocolate chips for a sweet and decadent breakfast. Mix together the pancake mix, milk, Kelapo Coconut Oil, eggs, and cinnamon until blended. The batter might be a little lumpy. Fold in the pumpkin puree and chocolate chips until completely mixed in. Spray a griddle or pan with coconut oil cooking spray and heat over medium heat. Once heated pour pancake batter on griddle as big as you would like the pancakes to be, around 1/4 cup of batter. Push sliced bananas into top of pancake while other side cooks. Flip once bubbles start to form on the top and edges begin to look a little cooked. Cook until golden brown. Top immediately with Kelapo Coconut Oil and maple syrup. Serve with bacon and eggs for a filling weekend breakfast. Enjoy!